Previous PostSeance Time at AESNext PostBricks in the Wall: Are We Alone in the Galaxy? I do think Davina decided to leave the trans scene completely cutting any ties shortly after the last issue of TransSister, I subscribed and do have the complete publication from the first to the last issue. It was an amazing and very important journal for trans feminist awareness raising back then. I’m not sure Davina is still among us. From what I seem to recall she underwent some sort of religious crisis after ceasing publication. I feel fortunate to have be following the eemate and it did form me as a lesbian femist and proud transwoman. Thank you so much for sharing this interview, of which I was unaware! I’ve read the four chapters from your novel that I found on your site, and at the time took it as a kind of allegory of your experiences and struggles while at Olivia, and also the incredible sisterhood and solidarity there. There’s a point in the interview where Deborah Feinbloom, truly a mensch, is mentioned, but the conversation shifts to other nontrans women scholars writing about trans issues. I’d be curious what you might have said about her, because to me she’s really a germinal figure in all this. The question raised about transsexual Lesbian feminism in the earlier 1970’s is where maybe I can help, and she’s very important in that. Back in 1973, after the confrontation at the West Coast Lesbian Conference involving Beth Elliott and Robin Morgan, the Second Wave magazine in Boston ran Morgan’s speech against transsexualism and wanted another perspective. At that time I was going through social transition, and wrote an article “Beyond Two-Genderism: Notes of a Radical Transsexual.” It would be interesting to know if similar things were happening elsewhere: I know that there was a response among Lesbian feminists in California to the Beth Elliott controversy, with some strong voices defending her. Deborah Feinbloom was an incredible source of support for me, personally and on the theoretical and academic fronts. She, along with an academic colleague of hers, another transsexual Lesbian feminist and I collaborated as the four coauthors of an article that got published in the Journal of Homosexuality (1976). During 1973-1975 I had various experiences with Lesbian and other feminist groups. 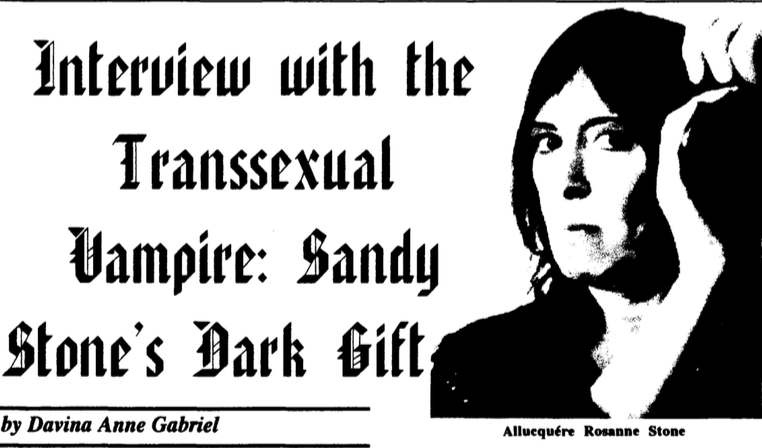 Early in 1974, if I’m right, I was asked to stop volunteering at a university Women’s Center because of my transsexual status; I don’t know if Janice Raymond, who was to interview me maybe a bit later, had any role in this. However, when I became a member of a Lesbian theater group and got outed, we had a meeting in usual small group feminist style, and it was decided that I should stay. We did some performances at a local Lesbian bar, and it was a rewarding experience. The interview with Janice Raymond was interesting: she’s my sister, and I’d emphasize her humanity. In speaking about Mary Daly’s theology, she was very engaging. She told me that I was very “feminine,” which struck me a bit curious, as basically (then and now) a granola Femme with no makeup, practical shoes I’m ready to walk a number of miles in, a maxiskirt, and a straightforward top and maybe a blazer or the like. She asked me about the fact that “feminists” thought that the participation of transsexuals hurt the movement, and I replied by recalling that the same thing had been said not so far back about Lesbians (e.g. the Lavender Menace zap at the Second Congress to Unite Women in 1970 and Betty Friedan and all that). Anyway, thank you for sharing the interview and so much more; seeing Deborah Feinbloom’s name vividly brought back some herstory she helped make happen.